We flew to Ireland from Edinburgh. We arrived on a cold rainy afternoon. We always spoke about visiting Ireland for a long time and always had a picturesque image in mind. We always imagined green hills, enormous castles, peaceful valleys and plenty of wonderful national parks. And this is what I found. This country, rich in greenery, needs no introduction. It is well known for its wide stretches of green fields, in fact its nickname is the Emerald Isle. But that’s not all, Ireland boasts large areas of rocky landscapes. It is not the biggest country in the world, but it has a startling reputation. The astonishing views, super friendly locals and fascinating landscapes are some of the factors that make Ireland a popular tourist destination. Everything positive you heard about Ireland is probably true. Year after year, Ireland is voted as one of the Top 10 cities in the world to visit. In this article I will explore why Ireland, Dublin in particular, shines. One thing that is easily noticeable about Ireland is that the Irish have great love for nature and rural life. Low levels of development and pollution in Ireland have left most of the nation’s open spaces relatively untouched. Another thing I noticed while visiting this breathtaking country is that the Irish smile a lot. Wherever you go, you will be met by smiles and friendly service. If you ask for help, you receive much more information than you ask for. They go out of their way to help you. This is one of the few countries where I experienced this. What did I do in Dublin? Before we booked the flights to Dublin, we googled quite a lot. We learned that there is so much to do, and it is not only about nature or pubs. If your time in the city is limited make sure you visit some of the following places mentioned below, to get the most from your Irish getaway. Start your visit with a trip to Dublin Castle. 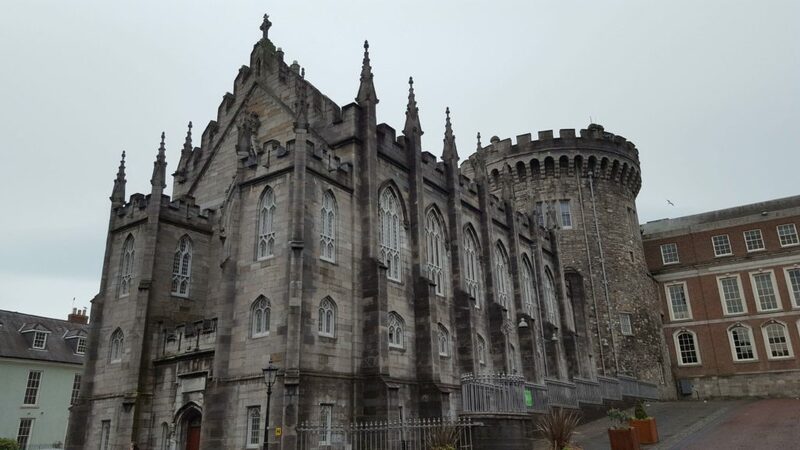 Erected in the early thirteenth century on the site of a Viking settlement, Dublin Castle served for centuries as the headquarters of English, and later British, administration in Ireland. It is open from Monday to Sunday and Bank Holidays from 9.45 to 17.45. Tickets can be purchased on site at the Castle’s visitor reception desk in the State Apartments or can be booked online. The Castle is in the heart of the city and the heart of Irish history. It is today one of the country’s exclusive cultural sites and is used by the Government for eminent functions of State, most significantly the inauguration of the President. And if you are an avid reader and literature nerd, Dublin got something for you too. You simply can’t visit the Irish Capital without the Book of Kells being mentioned. It is arguably one of the most renowned artifact on display in Dublin. Considered to be one of the most precious medieval artifacts, the Book of Kells, is the finest illuminated manuscript to have been produced in that era. The Book of Kells is 13 inches wide and 10 inches high. It consists of 340 folios made from calfskin vellum. 680 individual pages (340 folios) have survived, and of them, only two lack any form of artistic ornamentation. The Book of Kells consists mainly of the four Gospels. Also found in the book are so-called canon tables, which are indexes of passages that occur in two or more of the Gospels. The book was created sometime around the year 800 but scholars have been unable to determine where. The debate centers on whether the book was begun on Iona and finished at Kells or if it was created only on Iona. Some acedimics claim that the book is not connected to Iona at all, but was produced entirely at Kells. 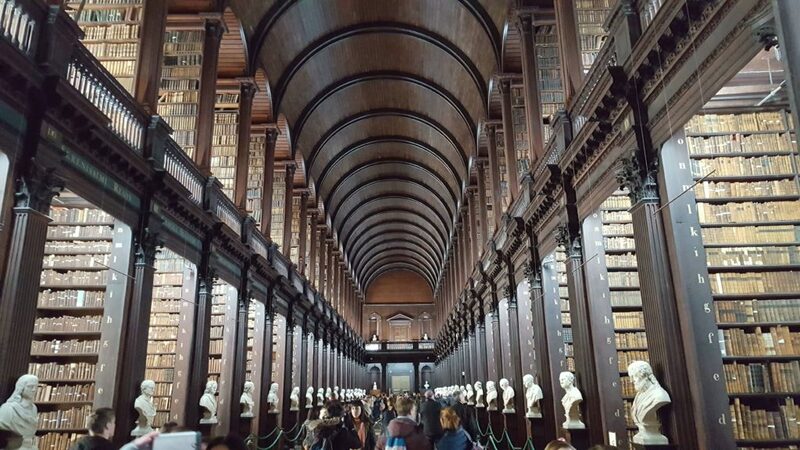 The Book of Kells has been on display in Trinity College’s Old Library since the middle of the nineteenth century and attracts an average of 500,000 visitors each year. Trinity’s tradition of independent intellectual inquiry has produced some of the world’s finest, most influential writers such as Oscar Wilde. We took a tour held by a student, it was very interesting and interactive. It took approximately an hour but it was totally worth it. 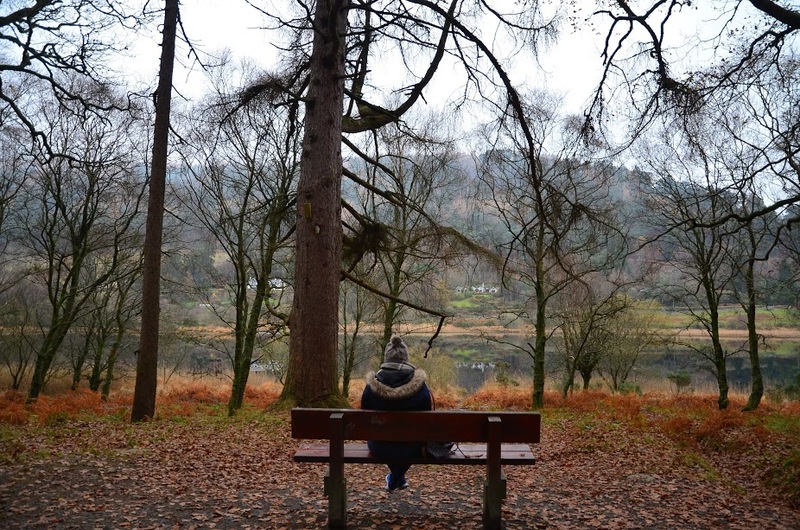 Glendalough is the kind of place that will still your mind, inspire your heart and fill your soul. It is by far one of my favourite spots in Ireland. When I reminisce, it makes me want to travel back in time to enjoy fun experiences again. 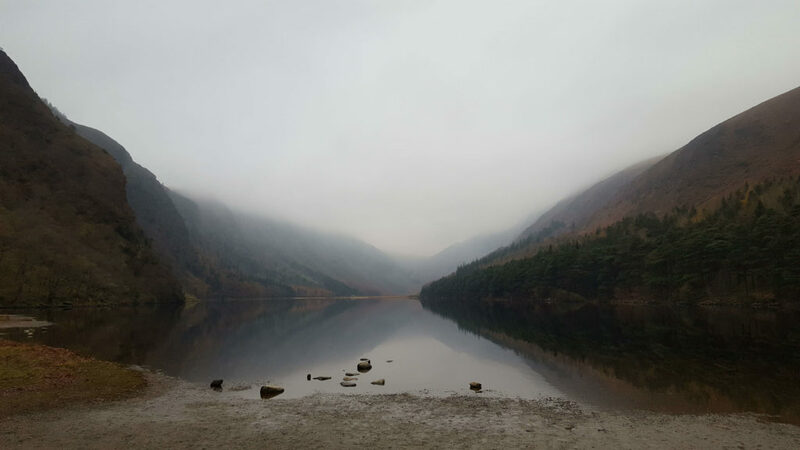 Glendalough is one of the most gorgeous natural parks I have visited. The landscapes and scenery is inspiring. It also offers a unique mix of natural, historical, archaeological and spiritual riches. 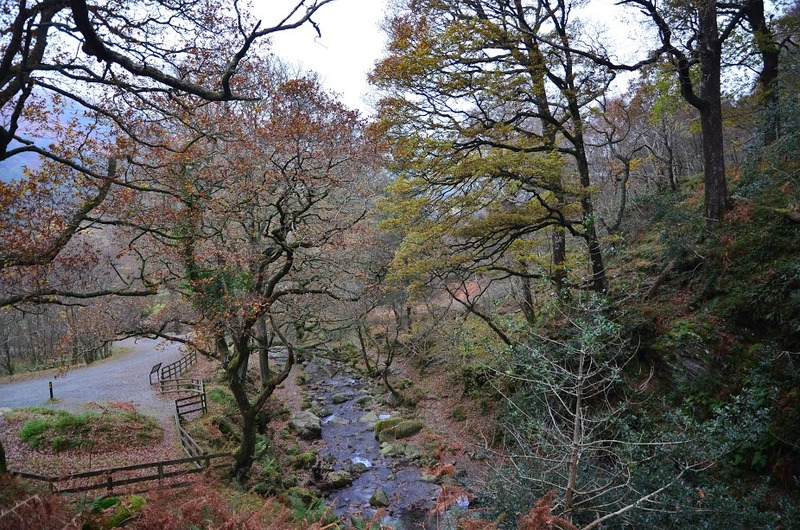 The valley is situated in Wicklow Mountains National Park which is home to forests, mountains, rivers, lakes and waterfalls. Many and varied walking trails can be found to suit all visitors. The valley is also a haven for wildlife and their habitats, flora and fauna. 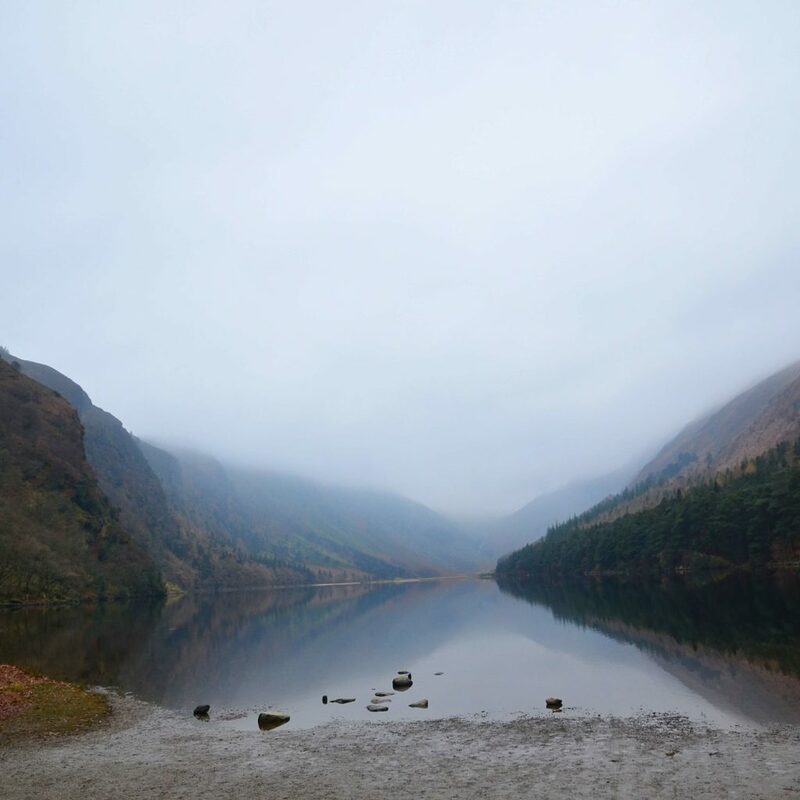 Glendalough, is also the site of a Monastic City, featuring the remains of an early Irish Christian monastic settlement dating from the 6th century onwards. After exploring the park or several hours we got extremely cold and walked back to the tourist centre. It was quite early for the ride back and decided to go for a hot chocolate. We weren’t spoilt for choice, there was only one hotel within walking distance. I am sure that even if you haven’t been to Dublin you heard about The Temple Bar. The Temple Bar area offers the best of Dublin: pubs, art galleries, restaurants, shops and cafes. 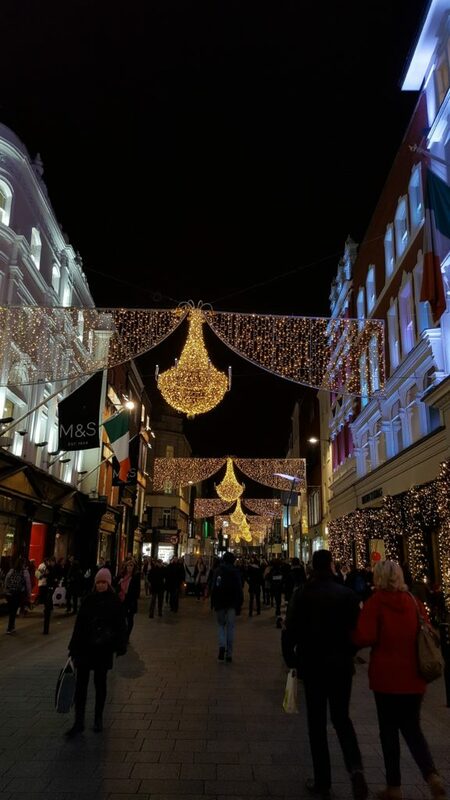 If you are looking for a fun night out, lively areas or entertainment, the Temple Bar area is the place for you to be. It is generally considered to be on the list of top attractions in Dublin and visited by everyone. Mornings in temple bar are boring, afternoons start slow and the evenings are packed and full of life. Especially during the weekend. One piece of advice is to check the prices before, as the prices can be sky high. 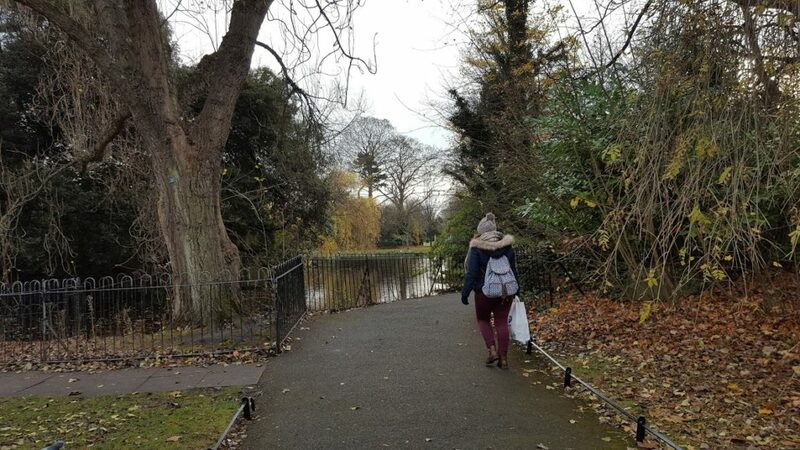 On our last day in Ireland we went for a lovely stroll along St. Stephen’s Green park. 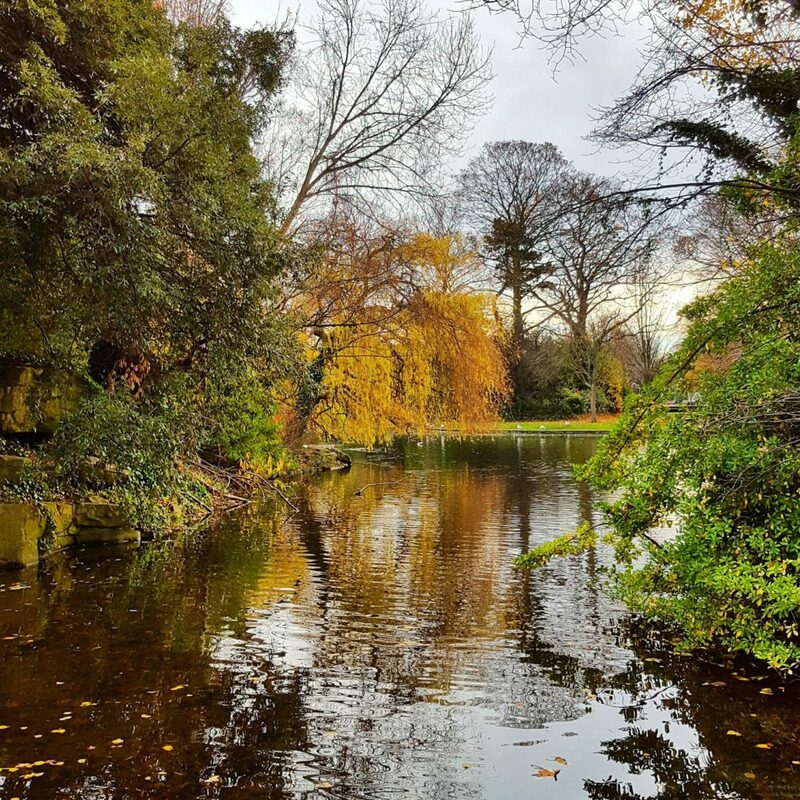 Also known as Ireland’s best Victorian park, St. Stephen’s Green is a 22 acre park. It is popular among tourist but also with locals who frequent this park to get a break from their busy schedule. The park wasn’t crowded and it was easy to find our way around with the maps strategically placed throughout the gardens. The park itself hosts a large number of important sculptural monuments to Irish history. Many species of birds and plants also call the park their home. It features an amazing playground in the centre, ideal for families with kids. After exploring the park we did some shopping. Or well, a lot of shopping. If I haven’t mentioned it before, I would like to point out that Dublin is a good shopping city. Strolling through the pretty city center, you’ll hit upon a wealth of high- end shops, with major luxury brands sitting next to chic boutiques, antiques and local crafts. 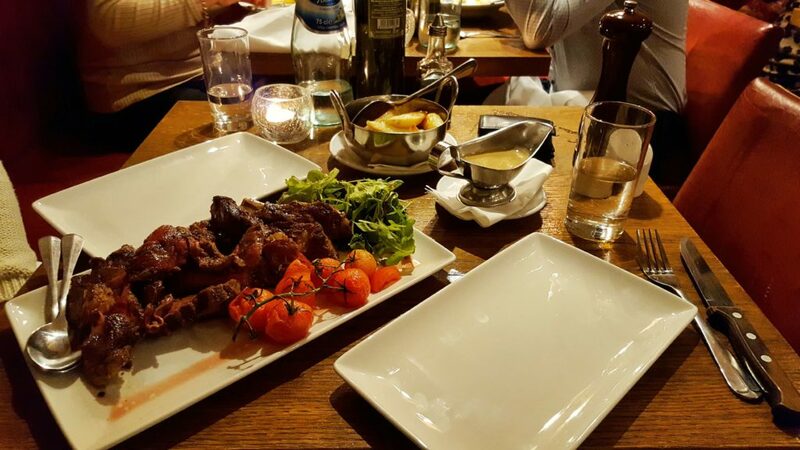 We read about Il Vicoletto before we went to Dublin and made it a point that we try it once there. 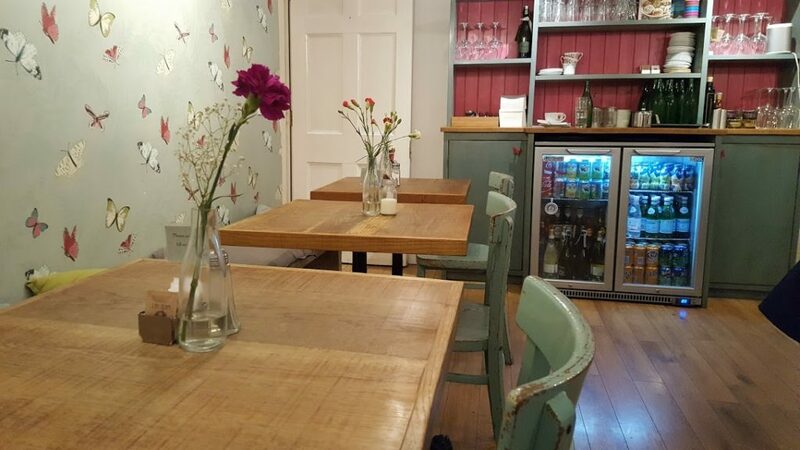 The restaurant is quite intimate and has a quaint atmosphere but is always packed. We went a bit early and were able to snag a table without reservation. We had the fresh Buratta as a starter and the Beef Tagliata as a main. The service was top- notch, we were graciously accommodated and taken care of. If we go back to Dublin I am sure that we will return. Whilst strolling in Dublin we stumbled across a very charming coffee shop. Dolce Sicily on Dawson Street is a pretty special coffee shop. Expecting to find the usual selection of ham, cheese and tomato combos, we were seriously impressed by the creativity and inventiveness. Moreover, we were excited about their delicious selection of pastries. Dolce Sicily is not to be missed. I fell head over heels in love with the stylish decor.